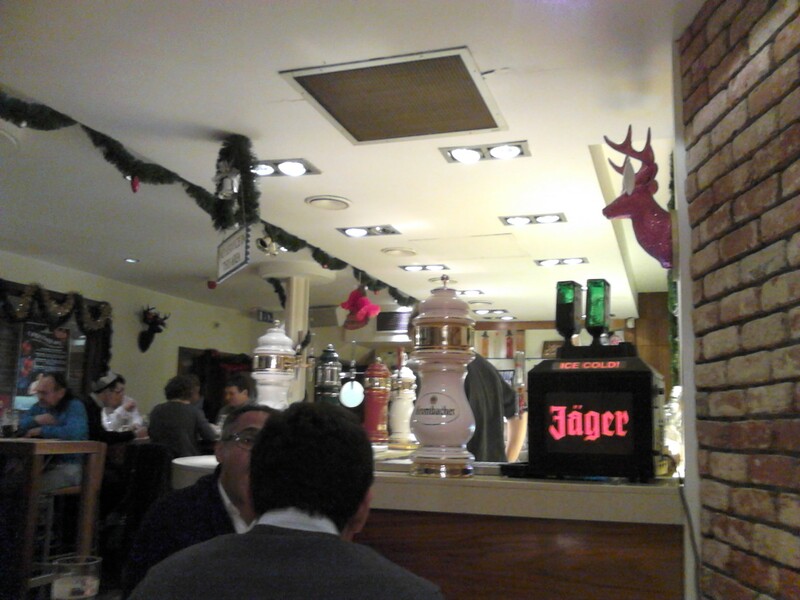 Entering the Bavarian Beerhouse, it felt as if we’d gone back to the 90s. The place had little to no atmosphere. The only ‘atmosphere’ there was was being provided by a rowdy gang who were out on their work Christmas do. Too much Bavarian beer for them! But maybe that’s just what it’s like in rural Germany. The tables were covered in some plastic, checked table cloths and were very long, narrow and rickety. So narrow, in fact, that our knees touched underneath. The waitresses were dressed in interesting, traditional get up. Checked (again!) dress things that revealed rather a lot of cleavage. 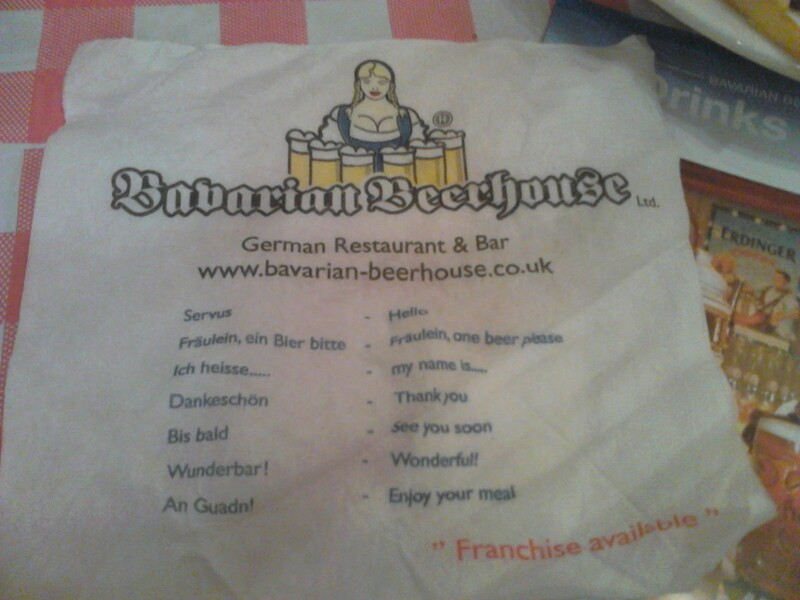 It felt as if we were eating in a German Hooters. Anyway, on to the food and drink. They had Jäger on tap, but we had a slightly more sedate evening planned and were more tempted by the wide selection of German beers on offer. 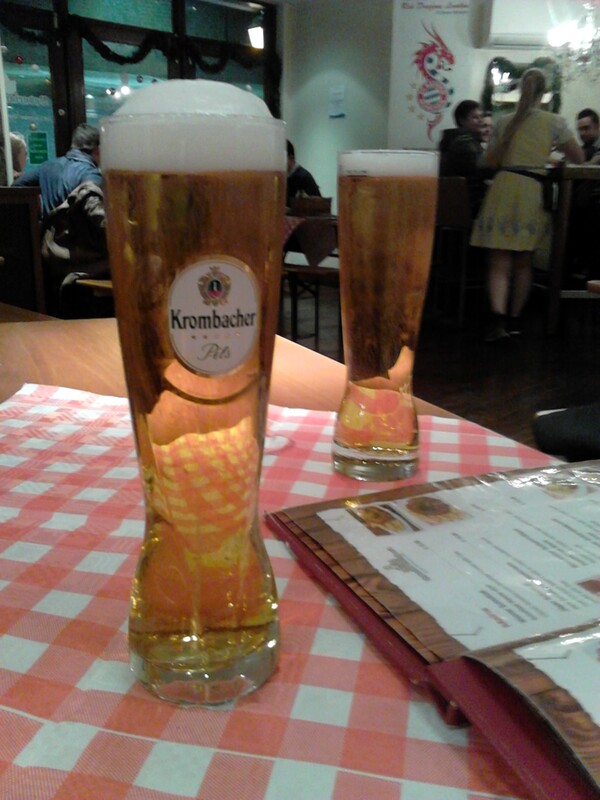 We both went for Germany’s No1 Premium Beer, Krombachers Pils. We were quite impressed. It turns out that German food is rather similar to Czech – lots of schnitzel and not much in the vegetarian realm. 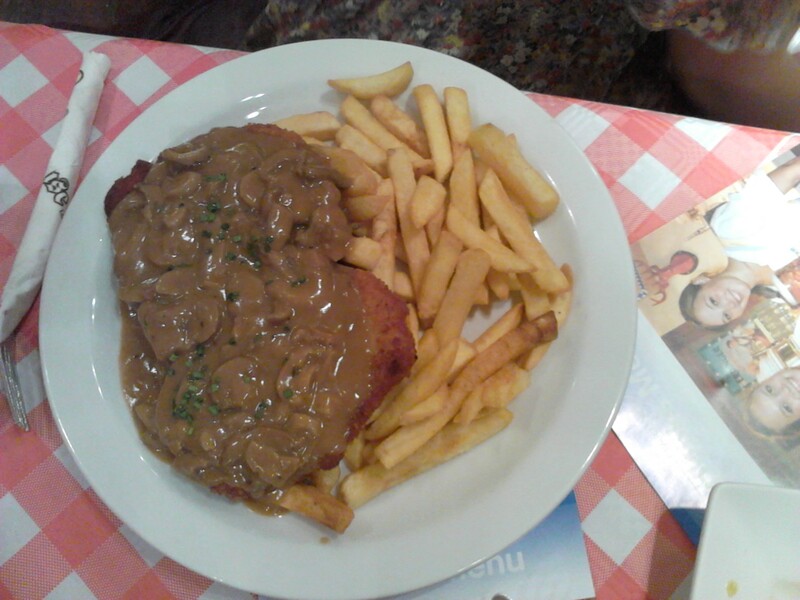 After much deliberating between varieties of schnitzel, Ruth decided on the Jäger Schnitzel; a pork escalope topped with a creamy mushroom sauce and served with fries. 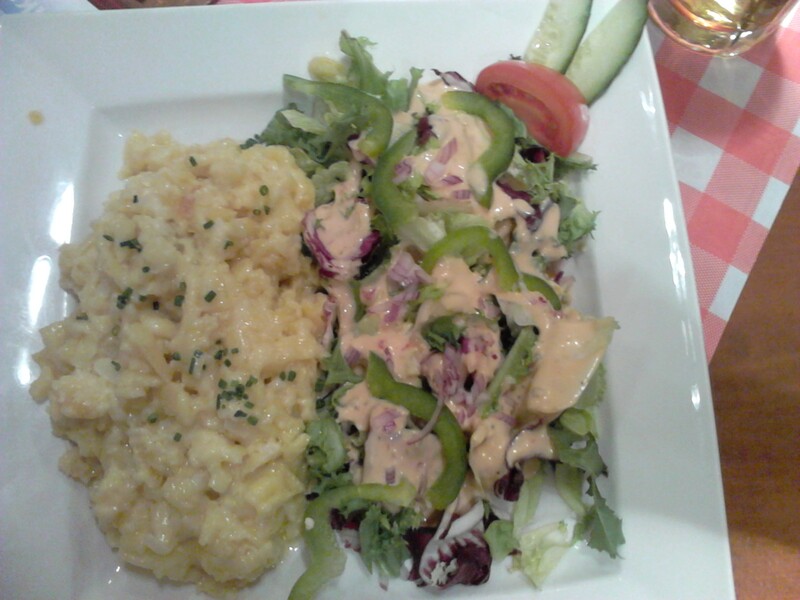 I chose to sample the Käsespätzle (aka Bavarian cheese noodles); a special noodle dish with cheese, onions, cream and mixed salad. Ruth’s schnitzel went down a treat. She was a fan of the mushroom sauce, succulent pork and pleasantly crispy chips, and left satisfying full. Mine, however, was somewhat disappointing. It was macaroni cheese with an ever-so-slight twist. There was far too much of it for my liking and it soon became quite monotonous. But that was to be expected. The German’s don’t do vegetarian. Service 7/10, food 7/10, environment 5/10. This entry was posted in Uncategorized and tagged Bavarian Beerhouse, Dining, dinner, Dinnergeddon, Eating out, Food, Germany, Jager, London, restaurants, schnitzel, Tower Hill by dinnergeddon. Bookmark the permalink.